Meet my somm school mates: the class of 2014-15 could be guiding you through your next dinner or tasting. For the past two academic years, dozens of trainee sommeliers have religiously been spitting (not swallowing) vino in the quest to become the next generation of Argentina’s professional wine stewards. While several schools offer sommellerie degrees in Buenos Aires, the academic choice of a photographer, wait staff, a rock star, lawyers, a wine seller, cooks, bartenders and a journalist (me) was the Centro Argentino de Vinos y Espirituosas (CAVE). Taking classes three afternoons a week in subjects such as enology, spirits and gastronomical appreciation, we’ve sat dozens of exams, sampled hundreds of vintages, and created menus and a Facebook self-help group that frequently goes off topic. But now it’s graduation time. 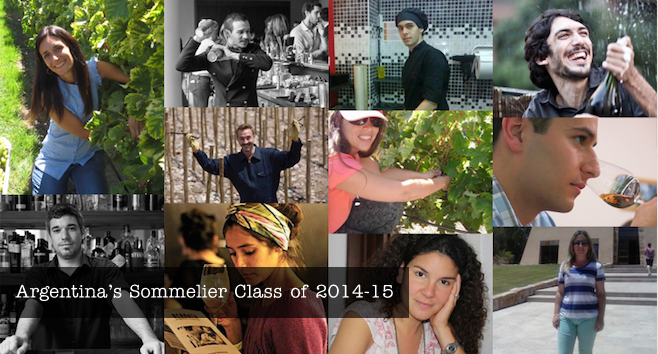 Remember my somm school mates’ faces: the class of 2014-15 could be guiding you through your next dinner or tasting. Córdoba native Angelina Ferreyra has an impressive CV, working at award-winning restaurants such as Florería Atlántico and Unik, and she’ll spend this summer at the legendary La Huella in José Ignacio, Uruguay. She says: “I’ve worked in gastronomy since I was 14 and I decided to study wine in order to give more professional meaning to my daily life. I really enjoy my work and the ability to experience then communicate a chef’s or enologist’s ideas – there’s a large team behind every wine or dish. It’s both fun and gratifying.” Set to visit Mendoza on the school study trip in March 2015, Angelina wants to unearth more about regional pairings and visit more wineries and olive farms.